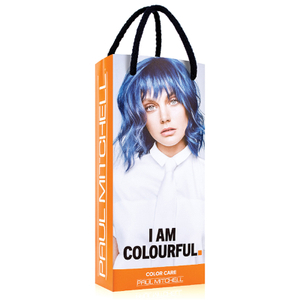 Maintain healthy, glossy locks with the I Am Colorful Color Care Bonus Bag from Paul Mitchell. Combining a radiance-enhancing shampoo and conditioner, the duo work in tandem to cleanse, hydrate and prolong colour vibrancy in between salon appointments. Effortlessly eliminating excess oil and impurities from colour-treated hair, the lightweight shampoo strengthens from root to tip, whilst defending against UV damage, environmental aggressors and pollution that can cause dullness. Enriched with Sunflower Extract, you can expect vibrant, healthy hair with a super soft feel. Penetrates deep into hair to effortlessly detangle and smoothen strands, leaving locks calm, manageable and healthy-looking. Specially formulated with Sunflower Extract to shield hair against exposure to harmful UVA and UVB rays, the hydrating conditioner preserves coloured hair and prevents fading. Experience salon-style results every time and locks that are vibrant, soft and bursting with moisture. Shampoo: Apply a small amount. Massage. Rinse. Conditioner: Apply to clean, damp hair. Rinse.